The Padang chapter of the Meteorology, Climatology and Geophysics Agency has detected 260 hot spots in Sumatra, mostly in the lower half of the island, in Jambi, South Sumatra and Lampung, a report said on Monday, according to The Jakarta Globe Report. The Central Kalimantan forestry office also confirmed several forest fires in a number of districts in the province, creating thick smoke that was blown to nearby cities, as the dry season continues in Indonesia. The condition has prompted concerns that the smoke could blow toward neighboring countries, especially Singapore and Malaysia, which would cause rebukes across the region. “The hot spots have caused several areas in Sumatra to be blanketed by smoke, including West Sumatra,” Antara news agency quoted Neli Elfira, a weather analyst at the Padang office of the agency known as BMKG, as saying. Neli said that most of the hot spots were in Jambi and Lampung. But BMKG was not certain how they started, whether caused by fire in dry forests or by land clearing from farmers or plantation companies despite an official ban on using the slash-and-burn method. The analyst said that dry winds from Australia will continue to head to the Asian mainland in the next few days. There would be no let-off and only rain could reduce the number of hot spots, she said. “In a climatic condition that is hot and dry, forest fires can erupt easily and therefore people are asked to be more alert,” Neli said. She said that the smoke is reducing visibility in many areas to just 7 to 10 kilometers, even though the figure was still safe for aviation. Although banned, land clearing via burning before the new planting season is still being practiced in the face of weak law enforcement. “We hope the hot spots can decrease and the wind does not blow too strong so that we don’t have to export smoke to our neighboring countries,” said Neli. In Sampit, Central Kalimantan, the Forestry Ministry office said that it detected 87 hot spots in the district alone. “Satellite observation by the National Oceanic and Atmospheric Administration has detected 87 hot spots in August and September,” said Andreas Dody, head of data management at the office. He expressed fear that the number of hot spots on the island will continue to increase in September as people clear lands using fire during the dry season. Forest fires in Sumatra and Kalimantan over the past week have brought to Singapore’s northern areas a “moderate” Pollutant Standards Index reading of 53 as of 4 p.m. on Monday. Last week, the poor air quality was noted only in the northern part of Singapore however. Other areas of the island recorded readings of 33 to 41. 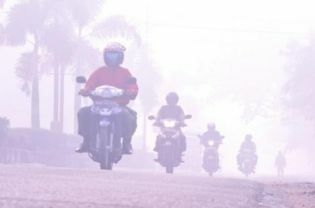 Earlier this month, haze from hot spots in Sumatra had also affected Malaysia. The air quality was rated as unhealthy in Perak and Selangor.